Apart from hydrogen, nonmetals are located in the p-block. Helium, although an s-block element, is normally placed above neon (in the p-block) on account of its noble gas property. In chemistry, a nonmetal (or non-metal) is a chemical element that mostly lacks metallic attributes. Physically, nonmetals tend to be highly volatile (easily vaporized), have low elasticity, and are good insulators of heat and electricity; chemically, they tend to have high ionization energy and electronegativity values, and gain or share electrons when they react with other elements or compounds. Seventeen elements are generally classified as nonmetals; most are gases (hydrogen, helium, nitrogen, oxygen, fluorine, neon, chlorine, argon, krypton, xenon and radon); one is a liquid (bromine), and a few are solids (carbon, phosphorus, sulfur, selenium, and iodine). Moving rightward across the standard form of the periodic table, nonmetals adopt structures that have progressively fewer nearest neighbours. Polyatomic nonmetals have structures with either three nearest neighbours, as is the case (for example) with carbon (in its standard state[n 1] of graphite), or two nearest neighbours (for example) in the case of sulfur. Diatomic nonmetals, such as hydrogen, have one nearest neighbour, and the monatomic noble gases, such as helium, have none. This gradual fall in the number of nearest neighbours is associated with a reduction in metallic character and an increase in nonmetallic character. The distinction between the three categories of nonmetals, in terms of receding metallicity is not absolute. Boundary overlaps occur as outlying elements in each category show (or begin to show) less-distinct, hybrid-like or atypical properties. Although five times more elements are metals than nonmetals, two of the nonmetals—hydrogen and helium—make up over 99 per cent of the observable Universe, and one—oxygen—makes up close to half of the Earth's crust, oceans and atmosphere. Living organisms are also composed almost entirely of nonmetals, and nonmetals form many more compounds than metals. The marvelous variety and infinite subtlety of the non-metallic elements, their compounds, structures and reactions, is not sufficiently acknowledged in the current teaching of chemistry. There is not a rigorous definition of a nonmetal. They show more variability in their properties than do metals. The following are some of the chief characteristics of nonmetals. Physically, they largely exist as monatomic gases, with a few having more substantial (but still open-packed) diatomic or polyatomic forms, unlike metals, which are nearly all solid and close-packed; if solid, they generally have a submetallic or dull appearance and are brittle, as opposed to metals, which are lustrous, ductile or malleable; they usually have lower densities than metals; are poor conductors of heat and electricity when compared to metals; and have significantly lower melting points and boiling points than those of metals (with the exception of carbon). Chemically, the nonmetals have relatively high ionisation energy and high electronegativity; they usually exist as anions or oxyanions in aqueous solution; generally form ionic or interstitial compounds when mixed with metals, unlike metals, which form alloys; and have acidic oxides whereas the common oxides of the metals are basic. Arsenic (here sealed in a container to prevent tarnishing) is commonly classified as a metalloid, or at other times as a nonmetal, or as a metal. The elements generally classified as nonmetals include one element in group 1 (hydrogen); one in group 14 (carbon); two in group 15 (nitrogen and phosphorus); three in group 16 (oxygen, sulfur and selenium); most of group 17 (fluorine, chlorine, bromine and iodine); and all of group 18 (with the possible exception of oganesson). The distinction between nonmetals and metals is by no means clear. The result is that a few borderline elements lacking a preponderance of either nonmetallic or metallic properties are classified as metalloids; and some elements classified as nonmetals are instead sometimes classified as metalloids, or vice versa. For example, selenium (Se), a nonmetal, is sometimes classified instead as a metalloid, particularly in environmental chemistry; and astatine (At), which is a metalloid and a halogen, is sometimes classified instead as a nonmetal. Nonmetals have structures in which each atom usually forms (8 − N) bonds with (8 − N) nearest neighbours, where N is the number of valence electrons. Each atom is thereby able to complete its valence shell and attain a stable noble gas configuration. Exceptions to the (8 − N) rule occur with hydrogen (which only needs one bond to complete its valence shell), carbon, nitrogen and oxygen. Atoms of the latter three elements are sufficiently small such that they are able to form alternative (more stable) bonding structures, with fewer nearest neighbours. Thus, carbon is able to form its layered graphite structure, and nitrogen and oxygen are able to form diatomic molecules having triple and double bonds, respectively. The larger size of the remaining non-noble nonmetals weakens their capacity to form multiple bonds and they instead form two or more single bonds to two or more different atoms. Sulfur, for example, forms an eight-membered molecule in which the atoms are arranged in a ring, with each atom forming two single bonds to different atoms. 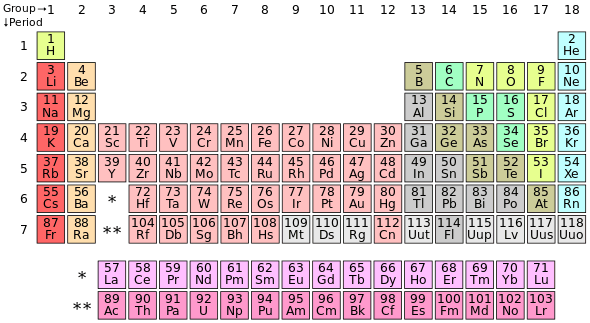 From left to right across the standard form of periodic table, as metallic character decreases, nonmetals therefore adopt structures that show a gradual reduction in the numbers of nearest neighbours—three or two for the polyatomic nonmetals, through one for the diatomic nonmetals, to zero for the monatomic noble gases. A similar pattern occurs more generally, at the level of the entire periodic table, in comparing metals and nonmetals. There is a transition from metallic bonding among the metals on the left of the table through to covalent or Van der Waals (electrostatic) bonding among the nonmetals on the right of the table. Metallic bonding tends to involve close-packed centrosymmetric structures with a high number of nearest neighbours. Post-transition metals and metalloids, sandwiched between the true metals[n 3] and the nonmetals, tend to have more complex structures with an intermediate number of nearest neighbours. [n 4] Nonmetallic bonding, towards the right of the table, features open-packed directional (or disordered) structures with fewer or zero nearest neighbours. As noted, this steady reduction in the number of nearest neighbours, as metallic character decreases and nonmetallic character increases, is mirrored among the nonmetals, the structures of which gradually change from polyatomic, to diatomic, to monatomic. As is the case with the major categories of metals, metalloids and nonmetals, there is some variation and overlapping of properties within and across each category of nonmetal. Among the polyatomic nonmetals, carbon, phosphorus and selenium—which border the metalloids—begin to show some metallic character. 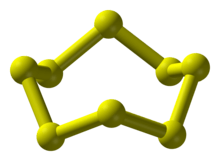 Sulfur (which borders the diatomic nonmetals), is the least metallic of the polyatomic nonmetals but even here shows some discernible metal-like character (discussed below). Of the diatomic nonmetals, iodine is the most metallic. Its number of nearest neighbours is sometimes described as 1+2 hence it is almost a polyatomic nonmetal. Within the iodine molecule, significant electronic interactions occur with the two next nearest neighbours of each atom, and these interactions give rise, in bulk iodine, to a shiny appearance and semiconducting properties. Of the monatomic nonmetals, radon is the most metallic and begins to show some cationic behaviour, which is unusual for a nonmetal. The polyatomic nonmetals are distinguished from the diatomic nonmetals by virtue of having higher coordination numbers, higher melting points (in their thermodynamically most stable forms), and higher boiling points; and having wider liquid ranges and lower room temperature volatility. More generally they show a marked tendency to exist in allotropic forms, and a stronger inclination to catenate; and have a weaker ability to form hydrogen bonds. The ability of carbon to catenate, in particular, is fundamental to the field of organic chemistry and life on Earth. [n 6] All of the polyatomic nonmetals are solids, and all are known in either malleable, pliable or ductile forms; most also have lower ionisation energies and electronegativities than those of the diatomic nonmetals. Seven nonmetals exist as diatomic molecules in their standard states: hydrogen (H2); nitrogen (N2); oxygen (O2); fluorine (F2); chlorine (Cl2); bromine (Br2); and iodine (I2). They are generally highly insulating, highly electronegative, non-reflective gases, noting that bromine, a liquid, and iodine, a solid, are both volatile at room temperature. Exceptions to this generalised description occur at the boundaries of the category: hydrogen has a comparatively low electronegativity due to its unique atomic structure;[n 7] iodine, in crystalline form, is semi-lustrous, and a semiconductor in the direction of its layers,[n 8] both of these attributes being consistent with incipient metallic character. The diatomic nonmetals are distinguished from the polyatomic nonmetals by virtue of having lower coordination numbers, lower melting points (compared to the polyatomic nonmetals in their thermodynamically most stable forms), and lower boiling points; and having narrower liquid ranges[n 9] and greater room temperature volatility. More generally, they show less inclination to exist in allotropic forms, and to catenate; and have a stronger ability to form hydrogen bonds. Most are also gases, and have higher ionisation energies and higher electronegativities than those of the polyatomic nonmetals. Six nonmetals occur naturally as monatomic noble gases: helium (He), neon (Ne), argon (Ar), krypton (Kr), xenon (Xe), and the radioactive radon (Rn). They comprise a group of chemical elements with very similar properties. In their standard states they are all colorless, odourless, nonflammable gases with characteristically very low chemical reactivity. With their closed valence shells, the noble gases have the highest first ionization potentials in each of their periods, and feeble interatomic forces of attraction, with the latter property resulting in very low melting and boiling points. That is why they are all gases under standard conditions, even those with atomic masses larger than many normally solid elements. The status of the period 7 congener of the noble gases, element 118 (oganesson) is not known—it may or may not be a noble gas. It was originally predicted to be a noble gas but may instead be a fairly reactive solid with an anomalously low first ionisation potential, due to relativistic effects. On the other hand, if relativistic effects peak in period 7 at element 112, copernicium (as is thought to be the case), oganesson may turn out to be a noble gas after all, albeit more reactive than either xenon or radon. Hydrogen, nitrogen, oxygen, fluorine, chlorine, plus the noble gases are collectively referred to as the elemental gases. These elements are gaseous at standard temperature and pressure (STP). They are also distinguished by having the lowest densities, lowest melting and boiling points, strongest insulating properties, and highest electronegativity and ionization energy values in the periodic table. It is not known if any synthetic elements with atomic number above 99 are gases. If it transpires that copernicium and flerovium are gaseous metals at or near room temperature, as some calculations have suggested, the category of elemental gases may need to be sub-divided into metallic and nonmetallic gases. Carbon, hydrogen, oxygen, nitrogen, phosphorus and sulfur are sometimes referred to or categorised as organogens, CHONPS elements or biogens. [n 10] Collectively these six nonmetals are required for all life on Earth. [n 11] They are further distinguished—in comparison to the halogens (F, Cl, Br, I, At) and noble gases—by their general capacity (or potential) to form allotropes;[n 12] high atomisation energies; intermediate electron affinities;[n 13] reactivity combined with low toxicity;[n 14] ability to form alloys with metals; and the weak or neutral acid-base character of their group hydrides. Selenium, and possibly boron, silicon, arsenic and tellurium, plus the organogen elements are sometimes categorized together as other nonmetals, as they fall outside the halogens and noble gases. The first five of these (Se; B, Si, As, Te) differ from the organogens: none are universally required for life; arsenic is notoriously poisonous; and tellurium hydride is a fairly strong, rather than weak, acidic hydride. Characteristic and other properties of polyatomic nonmetals, diatomic nonmetals, and the monatomic noble gases are summarized in the following table. Physical properties are listed in loose order of ease of determination; chemical properties run from general to specific, and then to descriptive. Many nonmetals have less stable allotropes, with either nonmetallic or metallic properties. Graphite, the standard state of carbon, has a lustrous appearance and is a fairly good electrical conductor. The diamond allotrope of carbon is clearly nonmetallic, however, being translucent and having a relatively poor electrical conductivity. 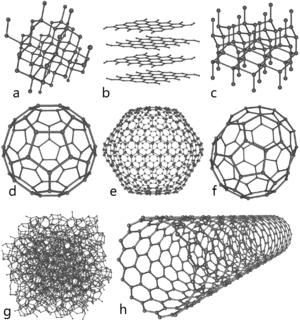 Carbon is also known in several other allotropic forms, including semiconducting buckminsterfullerene (C60). Nitrogen can form gaseous tetranitrogen (N4), an unstable polyatomic molecule with a lifetime of about one microsecond. Oxygen is a diatomic molecule in its standard state; it also exists as ozone (O3), an unstable polyatomic nonmetallic allotrope with a half-life of around half an hour. Phosphorus, uniquely, exists in several allotropic forms that are more stable than that of its standard state as white phosphorus (P4). [n 16] The red and black allotropes are probably the best known; both are semiconductors; black phosphorus, in addition, has a lustrous appearance. 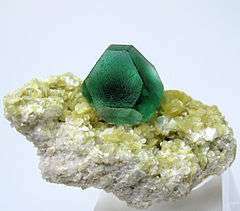 Phosphorus is also known as diphosphorus (P2), an unstable diatomic allotrope. Sulfur has more allotropes than any other element; all of these, except plastic sulfur (a metastable ductile mixture of allotropes) have nonmetallic properties. Selenium has several nonmetallic allotropes, all of which are much less electrically conducting than its standard state of grey "metallic" selenium. Iodine is also known in a semiconducting amorphous form. Under sufficiently high pressures, just over half of the nonmetals, starting with phosphorus at 1.7 GPa, have been observed to form metallic allotropes. Hydrogen and helium are estimated to make up approximately 99 per cent of all ordinary matter in the universe. Less than five per cent of the Universe is believed to be made of ordinary matter, represented by stars, planets and living beings. The balance is made of dark energy and dark matter, both of which are poorly understood at present. Hydrogen, carbon, nitrogen, and oxygen constitute the great bulk of the Earth's atmosphere, oceans, crust, and biosphere; the remaining nonmetals have abundances of 0.5 per cent or less. In comparison, 35 per cent of the crust is made up of the metals sodium, magnesium, aluminium, potassium and iron; together with a metalloid, silicon. All other metals and metalloids have abundances within the crust, oceans or biosphere of 0.2 per cent or less. Nonmetals, in their elemental forms, are extracted from: brine: Cl, Br, I; liquid air: N, O, Ne, Ar, Kr, Xe; minerals: C (coal; diamond; graphite); F (fluorite); P (phosphates); I (in sodium iodate NaIO3 and sodium iodide NaI); natural gas: H, He, S; and from ores, as processing byproducts: Se (especially copper ores); and Rn (uranium bearing ores). For prevalent and speciality applications of individual nonmetals see the main article for each element. Nonmetals do not have any universal or near-universal applications. This is not the case with metals, most of which have structural uses; nor the metalloids, the typical uses of which extend to (for example) oxide glasses, alloying components, and semiconductors. Shared applications of different subsets of the nonmetals instead encompass their presence in, or specific uses in the fields of cryogenics and refrigerants: H, He, N, O, F and Ne; fertilisers: H, N, P, S, Cl (as a micronutrient) and Se; household accoutrements: H (primary constituent of water), He (party balloons), C (in pencils, as graphite), N (beer widgets), O (as peroxide, in detergents), F (as fluoride, in toothpaste), Ne (lighting), P (matches), S (garden treatments), Cl (bleach constituent), Ar (insulated windows), Se (glass; solar cells), Br (as bromide, for purification of spa water), Kr (energy saving fluorescent lamps), I (in antiseptic solutions), Xe (in plasma TV display cells) and Rn (as an unwanted, potentially hazardous indoor pollutant); industrial acids: C, N, F, P, S and Cl; inert air replacements: N, Ne, S (in sulfur hexafluoride SF6), Ar, Kr and Xe; lasers and lighting: He, C (in carbon dioxide lasers, CO2), N, O (in a chemical oxygen iodine laser), F (in a hydrogen fluoride laser, HF), Ne, S (in a sulfur lamp), Ar, Kr and Xe; and medicine and pharmaceuticals: He, O, F, Cl, Br, I, Xe and Rn. The number of compounds formed by nonmetals is vast. The first nine places in a "top 20" table of elements most frequently encountered in 8,427,300 compounds, as listed in the Chemical Abstracts Service register for July 1987, were occupied by nonmetals. Hydrogen, carbon, oxygen and nitrogen were found in the majority (greater than 64 per cent) of compounds. The highest rated metal, with an occurrence frequency of 2.3 per cent, was iron, in 11th place. Sulfur and carbon were known in antiquity. The earliest known use of charcoal dates to around 3750 BCE. The Egyptians and Sumerians employed it for the reduction of copper, zinc, and tin ores in the manufacture of bronze. Diamonds were probably known from as early as 2500 BCE. The first true chemical analyses were made in the 18th century; Lavoisier recognized carbon as an element in 1789. Sulfur usage dates from before 2500 BCE; it was recognized as an element by Antoine Lavoisier in 1777. Phosphorus was prepared from urine, by Hennig Brand, in 1669. It was the first element to be chemically discovered. Cavendish, in 1766, was the first to distinguish hydrogen from other gases, although Paracelsus around 1500, Robert Boyle (1670), and Joseph Priestley (?) had observed its production by reacting strong acids with metals. Lavoisier named it in 1793. Carl Wilhelm Scheele obtained oxygen by heating mercuric oxide and nitrates in 1771, but did not publish his findings until 1777. Priestley also prepared this new "air" by 1774, but only Lavoisier recognized it as a true element; he named it in 1777. Rutherford discovered nitrogen while he was studying at the University of Edinburgh. He showed that the air in which animals breathed, after removal of exhaled carbon dioxide, was no longer able to burn a candle. Scheele, Henry Cavendish, and Priestley also studied this element at about the same time; Lavoisier named it in 1775-6. Scheele obtained chlorine from hydrochloric acid, but thought it was an oxide. Only in 1808 did Humphry Davy recognize it as an element. Courtois, in 1811, discovered iodine in the ashes of seaweed. In 1817, when Berzelius and Johan Gottlieb Gahn were working with lead they discovered a substance that was similar to tellurium. After more investigation Berzelius concluded that it was a new element, related to sulfur and tellurium. Because tellurium had been named for the Earth, Berzelius named the new element "selenium", after the moon. Balard and Gmelin both discovered bromine in the autumn of 1825 and published their results in the following year. In 1868, Janssen and Lockyer independently observed a yellow line in the solar spectrum that did not match that of any other element. In 1895, in each case at around the same time, Ramsay, Cleve, and Langlet independently observed helium trapped in cleveite. André-Marie Ampère predicted an element analogous to chlorine obtainable from hydrofluoric acid, and between 1812 and 1886 many researchers tried to obtain it. Fluorine was eventually isolated by Moissan, in 1886. In 1894, Lord Rayleigh and Ramsay discovered argon by comparing the molecular weights of nitrogen prepared by liquefaction from air and nitrogen prepared by chemical means. It was the first noble gas to be isolated. In 1898, within a period of three weeks, Ramsay and Travers successively separated krypton, neon and xenon from liquid argon by their differences in boiling points. In 1898, Dorn discovered a radioactive gas resulting from the radioactive decay of radium; Ramsay and Robert Whytlaw-Gray subsequently isolated radon in 1910. ↑ The standard state of an element (with one exception) is the most thermodynamically stable form of the element at ambient conditions. The exception is phosphorus, the standard state of which is the white allotrope, the most thermodynamically unstable, as well as the most volatile and reactive form. It is also the most common, industrially important, and easily reproducible allotrope. For those reasons white phosphorus (rather than the black allotrope, which is the most thermodynamically stable form) is the standard state of the element. ↑ Triple bonding is thought to represent the limit for main-group elements. Of the diatomic nonmetals only hydrogen has a shorter bond length, at 74 pm. ↑ True metals are the alkali metals, alkaline earth metals, lanthanides, actinides, and d-block metals up to group 11. ↑ Structural complexity in the post-transition metals arises due to the influence of partially covalent bonding, the directionality of which dictates fewer nearest neighbours. ↑ Metallic or metalloidal character is further shown by sulfur, as follows. It is a solid, as are nearly all metals, and all metalloids, whereas the large majority of nonmetals are not. It has the highest superconducting transition phase critical temperature (10 K at 93 GPa) among the non-metallic elements. Its most stable oxidation state is +6. 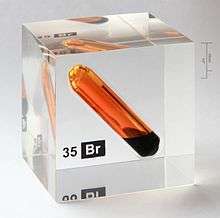 It has a well-established cationic chemistry in superacidic media, extending to the isolation of sulfur salts such as [S4]2+[SbF6]−2, a pale-yellow solid that is stable at room temperature. The lower electronegativity of sulfur compared to its lighter congenor, oxygen, largely means that transition metal sulfides are more likely to be alloy-like semiconductors or metallic conductors than the corresponding oxides, a trend also evident in lanthanide sulfides. Thus, cerium sulfide (CeS) has a metallic bronze lustre, exhibits high-level metallic electrical conductivity, and can be machined like a metal, and samarium sulfide (SmS), a black semiconductor, can reportedly adopt a golden metallic phase by way of pressure, polishing or simply scratching on single crystals. The diminished nonmetallic character of sulfur (and conversely its increased metallic character) is further shown by the fact that zinc sulfide does not dissolve in alkaline solution whereas zinc oxide does. Sulfur can be combined with carbon to form a disulfide (CS2), which, above 50 GPa, undergoes an insulator-to-metal transition. As yet this is puzzling behaviour given the most "metallic" organic polymers, other than compressed CS2, exhibit barely metallic conductivity. When sulfur is introduced as a doping agent, it causes silicon to exhibit metal-like conduction and associated enhanced light absorption characteristics (from low-frequency visible light through near- and short-wave-infrared wavelengths that would normally pass right through regular silicon). Sulfur is a photoconductor (sometimes described as a semiconductor), which means that its electrical conductivity increases by up to a million-fold when illuminated. The first photocopy was produced in 1938 using a photoconductive layer of fused sulfur on a zinc plate. Sulfur becomes a (liquid) semiconductor at 900 °C, with an electrical conductivity of 5 × 10−5 S•cm−1 (about a trillion times that of its room temperature conductivity, and twice that of boron, a metalloid). In 2013 researchers reported metallic conductivity in linear chains of sulfur atoms, isolated inside carbon nanotubes, at ambient conditions. Sulfur trioxide is a glass-former, as are oxides of phosphorus and selenium and, at 40 GPa, carbon dioxide. ↑ After carbon, phosphorus shows the next strongest ability to catenate. ↑ Hydrogen's single electron is not shielded from the single proton in its nucleus, resulting in hydrogen having an ionisation energy on par with that of oxygen. However, this configuration also means that a hydrogen atom's ability to attract another electron to itself is compromised by its single proton not being able to fully stabilise the electron-electron repulsion forces that arise between two valence shell electrons (resulting in the instability of the hydride H− ion). 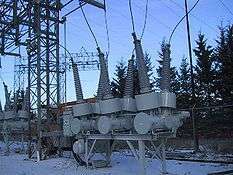 ↑ Iodine is an insulator in the direction perpendicular to its crystalline layers. ↑ The liquid range of an element is the difference between its melting point and boiling point. ↑ Selenium is counted as a metalloid in the last case, rather than a nonmetal. ↑ Carbon, oxygen, phosphorus and sulfur exist in well known allotropic forms. Hydrogen is known in metastable monatomic and unstable triatomic forms, in addition to its stable diatomic form. 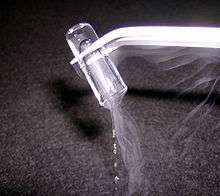 Monatomic hydrogen has a lifetime of a few tenths of a second to hours depending on the production technique (heating, electric arc or discharge, UV or microwave irradiation, electron bombardment) and containment method. It can be used, via a Langmuir torch, to weld or melt high melting point metals or compounds. Triatomic hydrogen is unstable and breaks up in under a millionth of a second. Its fleeting lifetime makes it rare, but it is quite commonly formed and destroyed in the universe. For nitrogen, the as yet unsynthesized allotrope octaazacubane (N8) is predicted to be metastable. ↑ Phosphorus in its most thermodynamically stable black form is generally inert (although still reactive compared to the noble gases) and has a low toxicity. White phosphorus, the most commonly known and encountered form, is metastable, highly reactive, flammable and poisonous. ↑ Carbon as exfoliated (expanded) graphite, and as metre-long carbon nanotube wire; phosphorus as white phosphorus (soft as wax, pliable and can be cut with a knife, at room temperature); sulfur as plastic sulfur; and selenium as selenium wires. ↑ White phosphorus is the most common, industrially important, and easily reproducible allotrope. For those reasons it is the standard state of the element. Paradoxically, it is also thermodynamically the least stable, as well as the most volatile and reactive form.